It is interesting how the theatre we have scheduled dovetails. For the longest time, we had planned to see Finks, at Rogue Machine Theatre (FB) in Venice: a story about artists having to testify in front of the House Un-American Activities Committee. But then my wife got involved with sisterhood at our congregation, and they scheduled a theatre night on top of Finks. So I arranged to move our Finks tickets Sunday night, and we arranged to go to the Sisterhood show. By now, I’m sure you’re asking: What show was it? I won’t attempt to summarize the stories here. I can say that all were interesting, many were very touching, and all fit with the theme. I did find quite a few of them inspiring — especially after a week of thinking about the impact of Jewish Summer camp on my life and seeing how it has instilled activism in people. They were certainly worth hearing. I’m sure you’re curious about which ones are sticking with me the most. I think the ones that struck a nerve with me were My Blessed Journey, The Chairs, and Worthy of Love. Why did they stick? That’s harder to say. What I think I can reliably say is that that at least one or two of the stories will resonate with you, and that this production (if it comes near you) is worth seeing. The stories were performed by four actors: Arva Rose, Vicki Juditz (FB), Emma Berdie Donson, and Robert Keller. All were strong. I urge you to pay special attention to their faces during the performances, for they do a great job of becoming different characters, as opposed to just reading the story. The production was adapted, curated, and produced by Ronda Spinak (FB), with additional production by Suzanna Kaplan. Susie Yure and Rose Ziff were Associate Producers. The production was directed by Susan Morgenstern. Barbara Koletsky was the Asst. Producer and Stage Manager. Daphna Shull was the Artistic Associate. I don’t know when JWT will be doing this production again, but they do have a show, Not That Jewish, coming up in early December and three shows schedules so far for 2019. 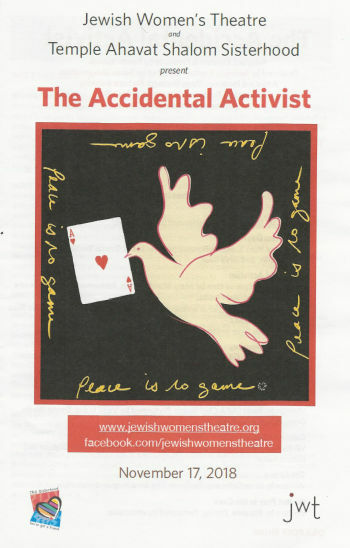 Information is available at the Jewish Women’s Theatre (FB) website. Sunday brings our second show of the weekend: Finks at Rogue Machine Theatre (FB). Thanksgiving weekend has Steambath at the Odyssey Theatre Ensemble (FB) on Saturday and Remembering Boyle Heights at Casa 0101 (FB) in Boyle Heights on Sunday. December starts with the Annual Computer Security Applications Conference (ACSAC), followed by a hold for the Canadian Brass at the Saroya [the venue formerly known as the Valley Performing Arts Center (VPAC)] (FB).